Bramwell Tovey is the winner of the Orchestras Canada Betty Webster Award for 2018. Maestro Tovey will receive the award at the Vancouver Symphony Orchestra’s June 30th outdoor concert, the first of three performances at the Olympic Plaza on the Canada Day long weekend. The annual appearances of the VSO and the Whistler Institute Orchestra are presented by the Resort Municipality of Whistler and the Province of British Columbia. The Betty Webster Award is presented each year to an individual or organization that has made a sustained and significant contribution over a number of years to the Canadian orchestral community, with an emphasis on leadership, education and volunteerism. It was established in 2002 to honour Orchestras Canada’s founding Executive Director and is a tribute to Mrs. Webster’s visionary leadership and her extraordinary contributions to the health and vitality of orchestras right across Canada. 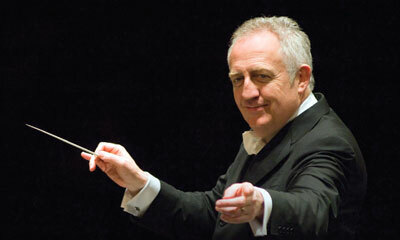 Bramwell Tovey is concluding his tenure as the Music Director of the Vancouver Symphony Orchestra, an orchestra he has led since 2000. In this time, he was relentless in his pursuit of excellence for the orchestra, programming works that would challenge, engage and inspire the musicians and the audience. His trademark charisma and charm, as well as his willingness to conduct a wide range of concerts (from classical to pops to education) have seen the VSO attract new audiences and retain a loyal following among the concert-going public of Vancouver. Tovey also takes an active role in the education initiatives of the VSO. He currently serves as the Artistic Advisor to the Vancouver Symphony Orchestral Institute at Whistler and was a driving force behind the 2011 opening of the VSO School of Music. Before his arrival at the VSO, Maestro Tovey was the Music Director at the Winnipeg Symphony Orchestra for 12 years, where he started the Winnipeg New Music Festival. Between his appointments with the WSO and the VSO, he has dedicated almost 30 years to the advancement of orchestras and symphonic music in Canada. Throughout that time, he has been committed to promoting Canadian artists and composers and has demonstrated his belief in music accessibility for all. Alongside those appointments, Tovey served as for 11 seasons as conductor and host of the New York Philharmonic’s Summertime Classics and has as held titled positions with the Luxembourg Philharmonic Orchestra, the LA Philharmonic at Hollywood Bowl, and guest conducted across Canada, the US, Europe, Australia and Asia. He now serves as Director of Orchestral and Conducting Studies at Boston University, and is the Principal Conductor of the BBC Concert Orchestra. The national jury was chaired by Waterloo-based conductor Matthew Jones (Kitchener-Waterloo Chamber Orchestra, Etobicoke Philharmonic), and included arts manager Ardyth Brott (Brott Music Festival/National Academy Orchestra—and winner of the 2017 Betty Webster Award), conductor Daniel Bartholomew-Poyser (Artist in Residence and Community Ambassador, Symphony Nova Scotia), arts manager Margot Holmes (Vancouver Island Symphony and Caline Arts Management), and violinist Adriana Lebedovich (Calgary Philharmonic Orchestra). Other recent winners of the Betty Webster Award include arts managers John Gomez in 2016 (Music Director, Ottawa Youth Orchestra Academy), Annemarie Petrov in 2014 (President & CEO, Edmonton Symphony), and Jeff Alexander in 2009 (former President & CEO, Vancouver Symphony Orchestra), double bassist Alison Mackay in 2013 (Tafelmusik Baroque Orchestra), and several organizations such as Tafelmusik (2009), the New Brunswick Youth Orchestra (2008) and the National Youth Orchestra of Canada (2007).